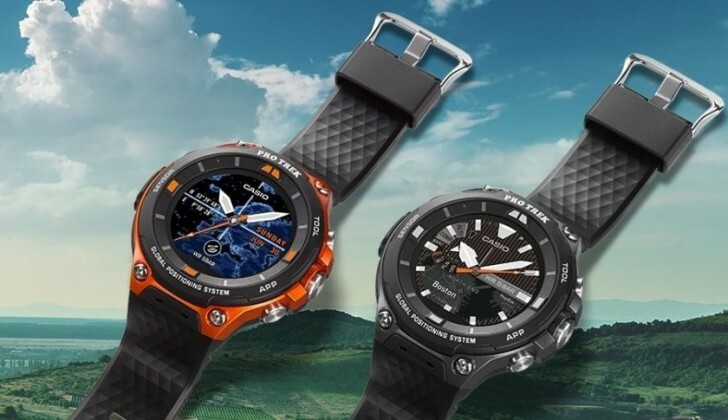 At CES in January, Casio unveiled its latest smartwatch, the Pro Trek Smart WSD-F20. This is the follow-up to the F10 from last year. And now the new F20 is finally up for grabs, almost four months after its announcement. You can pick one up in either black or orange for $500, at retailers such as Amazon. The Casio F20 runs Android Wear 2.0 out of the box, and it's water resistant up to 50m and complies with the MIL-STD 810G spec for durability. Its circular 1.32-inch touchscreen is of the dual-layer variety, with both a monochrome mode for high visibility and low power use, as well as a color mode for full functionality. The F20 has a power sipping GPS sensor, a digital compass, altimeter, and barometer. It features 512MB of RAM and 4GB of storage, and it's 0.8 mm thinner than its predecessor.